Kate Spade BY THE POOL Flamingo Pippa Leather Warm Vellum BUCKET BAG - NWT!! 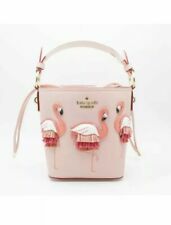 Kate Spade by the Pool Flamingo Pippa Bucket Bag BNWT! This page was last updated: 18-Apr 04:07. Number of bids and bid amounts may be slightly out of date. See each listing for international shipping options and costs.